This chapter is the first of several in this volume to document parents and children coming home from work and school and their challenges and triumphs in forging connections as a family. The concept "coming home" is filled with sentimentality in American society, and adages that capture these feelings abound: home is where the heart is; home is where one belongs; homeward bound. Yet these adages are misleading in assuming that familiarity and belonging are rewards that naturally await homebound working adults and children. Rather, such rewards are the result of an interactional endeavor that begins the instant that family members arrive home. Seemingly trivial behaviors like greeting or noticing a returning family member turn out to be consequential for opening lines of communication and nourishing parent-child and couple relationships. In his classic article on human interaction the sociologist Emanuel Schegloff argued that ostensibly mundane routines such as an exchange of greetings actually require a great deal of coordination and are best understood as complex interactional achievements. You might imagine that people who do not know each other well or who see each other rarely may have to pay attention to how they initiate and respond to each other's social overtures when they meet. But what happens when parents and children and couples meet one another on a daily basis after returning home from work and school? Is it also an effort for them to greet and reengage one another after going their separate ways during the day? The message of this chapter is, yes, initiating face-to-face social interaction between family members at the end of the work- and school day demands a degree of cooperation that is not always forthcoming in different families or in the same family from one day to the next or on the same day between one family member and another. Working parents may be warmly welcomed home by some members of their family but treated as if they were invisible by others. When CELF working parents arrived home, they often encountered family members who were content to see them but distracted by their own concerns. Garnering attention and reconnecting as a family was not a matter of course; rather, at times it was quite an undertaking. To get a sense of the vicissitudes of family reunions at the end of the day, we invite you to look at what transpired among members of the Gruvich family on two separate days after work and school. On one of these daysRay Gruvich had already arrived home from work and was sorting through the mail when his ten-year-old son, Tim, burst through the door calling out, "Hi Dad!" Ray asked, "How are you::: kiddo?," and Tim replied, "Fine!" Ray was buoyant: "Excellent. Good." They embraced. Next through the door was six-year-old Becky, followed by her mother, Beth. Ray approached them, greeting Becky with a long "Hello:::!," a kiss, and the observation, "You found your jacket, huh?" While Becky clamored for more attention, Ray and Beth greeted and kissed each other. The family had successfully reunited at the end of the day. Lest we think that this twenty-first-century family comes straight out of a 1950s TV series, let's observe how the Gruvich family welcomed each other on another day that week. On this day Ray's parents had picked up the children from school and brought them to their house. When Ray arrived at his parents' home after work, Tim and Becky were glued to the TV set watching a cartoon. While the reunion between Ray and his children began well, with Tim embracing his father and reporting on homework progress, Becky remained transfixed by the television and did not acknowledge her father. Even when Ray opened his arms for a hug and called, "Becky," she merely flashed him a nanosecond's glance. Ray then exclaimed, "Ah!," wryly noting his daughter's minimal acknowledgment of his presence. This lament prodded Becky to say, "Hi," but she did so while watching the cartoon. At this point Ray dropped his arms in exasperation, sighing, "Well, hi to you too," to deaf ears. And then an argument ensued. Ray asked Becky about her homework; she mumbled something, continuing to be entranced by the television; Ray pulled away the bottle of soda she had in her hand; reaching for the bottle, Becky protested, "No::! that's mi::ne!" Holding on to the bottle, Ray insisted, "Talk to me," until Becky resentfully responded to a stream of questions reminiscent of an interrogation: "Did you finish your homework?" "Who checked your homework?" "Is that your trash?" "When are you going to throw it away?" "I'll be back to check, okay?" Shortly after this rebuff, Ray's wife, Beth, arrived and greeted the children but overlooked him. As she passed him to help her mother-in-law in the kitchen, Ray twice called out "Hey!" to catch her attention, then entreated, "Say hi first, then you can go help." Beth retraced her tracks to affectionately greet her husband. The Gruvich family illustrates the challenges that working parents in the CELF households in Los Angeles encountered when reconnecting with the rest of the family after a day apart. Parents and children knew little about what happened in each other's lives during the day, including plans that affected the rest of the family. The first moments after returning home were imbued with parental anticipation of affection and information that was not always forthcoming. This daily pattern of being apart for at least six hours a day during the work- and school week contrasts with family life in a number of other societies, where school-aged children are isolated from family members for shorter periods. For example, many rural Samoan children attend school on the edge of the village close to their homes. While some parents work in the capital, other adult family members remain in the village. The path to some of the family plantations runs past the schoolhouse, allowing family members on their way to or from cultivation to overhear children's recitations or relay information if necessary. Children return home at midday and immediately become immersed in a thicket of family tasks. In such communities family members encounter each other intermittently throughout the day and are integrated through cooperative activities. If a child or spouse is out of sight, his or her whereabouts are easily gleaned from others who monitor the comings and goings of extended family members and neighbors. For better or for worse, working parents and children in the United States do not typically reside in family compounds or small communities. In Los Angeles CELF parents and children generally commuted to work and school. While grandparents play a vital role in American family life, middle-class parents typically live apart from their own parents in nuclear households. Most of these parents are unable to benefit from the kind of childcare commonplace in Samoan communities (see Introduction). In only a few CELF households, like that of the Gruvich family, did grandparents routinely take care of their grandchildren at certain times during the week. Children's schools are often not close to workplaces, and school policies may discourage parents from entering the classroom or otherwise contacting children at school except in emergencies. Beyond notice of illness or other calamities, parents in the United States usually receive little or no information about their children until late in the day. These long hours of separation make the vital process of reuniting more difficult; family members who spend the majority of their time in separate worlds may habituate to this arrangement and find it challenging to share their life-worlds spent apart in the relatively few hours that they are together in the home. The challenges imposed by the separate worlds of work and family mean that end-of-the-day reunions provide one of the few, and thus significant, opportunities of the day to show regard and affirm family bonds. As important as it is for family members to reconnect at the end of the day, the transition to being a family after a day apart is not always easy. As working parents know in their bones, children and adults can be exhausted as a result of the day's exertions, and their moment of reunion may be strained. During the week parents returning from work may be preoccupied with household- or workplace-related tasks; children usually have homework to complete; everyone may be hungry and grouchy. As in the Gruvich family, American children may sometimes give parents the silent treatment when seeing them in the late afternoon or evening. Television and other media may also contribute to such comportment. The homecoming transition is potentially tense when weary parents and emotionally needy young children reengage one another. Given its importance, we wondered how the CELF families in our study managed to reconnect at the end of the day. To what extent did they generally enjoy positive reunions? To what extent was the delicate process of reuniting as a family hampered by a family member being distracted? To address these questions and others, a team of psychologists and anthropologists analyzed the video recordings of families getting together after work and school. We focused on the thirty families in our study in which both mother and father worked-twenty-one with two children and nine with three children-to understand how the parents experienced reuniting with their children and partners. We focused on what happens in the first two minutes after mothers and fathers walk through the door from work. We asked the following questions: What kind of reception do working parents receive from their children and spouses? When working fathers arrive home, do they receive the same kind of welcome from their families as working mothers receive when they arrive home, or are fathers and mothers treated differently? Across the thirty dual-earner CELF families there was the potential for 120 reunions at home. But family members often reunited outside the home, at school or elsewhere. As recording conditions made it difficult for these reunions to be captured consistently on video, they were not included in this study. In addition, some parents did not reunite with the rest of their families at the end of the day because their jobs (e.g., as pilot, firefighter, sheriff) required them to work during that time. Our analysis includes a total of 44 reunions that took place at home. These reunions capture the first encounters with family members immediately after nineteen working fathers and ten working mothers returned home. Before getting to the results of our study, we want to consider how people all over the world encounter one another after having been apart for a period of time. The sociologist Erving Goffman noted that every person has a "face"-a valued image of the self that he or she wants to project and maintain in particular social situations. Relating this idea to working families, we can say that when family members come into contact at the end of the day, each has a face (i.e., an image of herself or himself as mother or father, daughter or son, sister or brother, or partner in a couple) that they want other family members to uphold. Birds do it; even bees do it. Not falling in love but greeting. Among the many interaction rituals of face appreciation, greetings have an important place. When we enter into one another's social sphere after a certain stretch of time apart, we support the face of the other by greeting him or her. The presence of a greeting distinguishes persons as valued. As Alessandro Duranti has written, "In many societies children and servants are not greeted. The absence of greetings then marks these individuals not only as nonproper conversationalists or strangers but also as not worth the attention implied by the use of greetings." If one person greets there is a strong expectation that the person greeted will return the greeting. If a person does not return a greeting, its absence is noticeable. When we reciprocate greetings (I greet you √ You greet me) we signal to each other that we find the other worthy of recognition. Each person demonstrates positive sentiments (e.g., respect, affection) toward the other and sets the emotional tone of downstream interaction. In the first set of greetings in the Gruvich family, for example, Ray appeared absolutely delighted when his son, Tim, called out, "Hi Dad!," as he burst through the front entrance. Ray nearly cooed his greetings to both his children and his wife, and they responded in kind, displaying their affection for one another. Alternatively, when one person issues a greeting and it is not reciprocated, an asymmetry in deference and face support results. The person greeted becomes a focus of attention and appreciation but the person who greets does not. On the evening when his daughter ignored him after he arrived from work and called out to her with his arms held wide open for a hug, Ray appeared upset. An important message is that no matter how intimate we are with another person, most of us (including members of our own families) in most circumstances have the desire to be acknowledged with a greeting. Even the simplest greeting has the potential to elicit a reciprocal greeting if not more conviviality. As such, greeting rituals help human beings to come together as a social unit. Social engagement may terminate with the greeting response ("Hi Dad" "Hi Susie"). Alternatively, the greeting may open the door to more sustained communication ("Hi Dad" "How are you::: kiddo?" "Fine!" "Excellent. Good"). This property renders the greeting a powerful medium for coming together as a family after a long day apart. Taking only a few seconds to produce, a greeting is an efficient ritual gateway to connecting to family members. It probably will come as no surprise to those documenting the lives of working women that the thirty working mothers in the CELF study had first contact with the children on 76 percent of the weekdays observed, whereas their spouses had first contact with the children on 20 percent of them and a babysitter or grandparent had first contact on 4 percent of them. Typically, the second parent arrived home to the partner and children roughly two hours later. Of the two weekdays that we video recorded during the workweek, mothers arrived home earlier 60 percent of the time, twice as often as did their spouses. That CELF mothers more often had first contact with their children and arrived home earlier than did their spouses makes sense when looking at the working hours of these mothers and fathers. CELF fathers worked about two hours a day longer than the mothers in the study. These parental differences in picking up children and returning home are compatible with other findings that contemporary working mothers assume the lion's share of childcare responsibilities. But overlooked in other studies is the possible effect that these arrangements may have on the integration of fathers into family life when they arrive home after mothers and children have been together. Let us now turn to how CELF mothers and fathers were integrated into the family when they returned home after work. Positive behaviors included instances in which family members greeted ("Hi Dad!") and acted affectionately. Greetings and acts of affection not only included words; bodily expressions counted as well (e.g., waves, high five signs, hugs). The first Gruvich family reunion illustrates such positive behaviors. Positive behaviors support the face wants of a returning parent by demonstrating that the parent's arrival home was noticed and/or appreciated. Positive behaviors toward a returning parent also opened the door to the possibility of continued social engagement between family members. Reports of information included exchanges in which a family member welcomed a returning parent with information about what happened during his or her day. Often these reports accompanied positive behaviors like greeting or noticing a returning parent. In just such an exchange, eleven-year-old Sandra Anderson ran toward her arriving father, then showed him a school paper that had received a good grade. Her father, reading the teacher's comments, responded "That's cool. Oh that's coo::l. That's great." Logistic behaviors included requesting help or information from the returning family member or talking about housework, school, or workplace obligations. For example, when working father Thomas Banks pulled into the driveway, his wife, Roberta, and daughter, Kayley, were cleaning the inside of Roberta's car. Kayley yelled, "Hey Daddy? Uh-can-can-uh-Can you get the vacuum cleaner out?" After being prompted by her mother, Kayley added, "Please," and a justification: "so that we can vacuum in the car." Thomas then teasingly turned on the ignition and started backing out the driveway, as Kayley chased him, flung open the door, repeated over and over, "You have to get it out," and tugged on him until he acquiesced. Negative behaviors by family members included overt displays of anger, criticism, and whining. When working mother Julia Dorbin emerged from her car and walked toward the front door, for example, her eight-year-old son, Josh, complained, "Mom, you said that you'd be here earlier." Julia corrected him: "This is earlier. Yesterday I didn't get home until five thirty." After asking, "What time is it?," and finding out that it was "a little after four," Josh cocked his head and raised his arms in exasperation, muttering sarcastically, "Big difference." As Julia entered the house she concluded the matter with the words, "Well, it is a big difference." In another CELF household, Anita Goodson arrived home before her husband, Chad, to discover that he did not refrigerate the chicken that the family was to eat for dinner. She called Chad on his cell, and when he arrived home she greeted him with, "So does that mean that's all spoiled? What did you do that for?" After Chad cautiously responded, "Well, I'll have to look at it and see," Anita walked away, insisting, "But you need to answer my question." To no avail it turns out, as Chad did not respond. Distraction occurred when a family member did not display recognition of a returning parent, either by being completely oblivious or by treating the parent as a secondary concern while primarily involved in another ongoing activity. For the returning parent distraction was not a desirable response. But unlike in the case of "negative behaviors" the distracted family member was not overtly angry or upset with the returning family member. Especially in the case of children, distraction was more often an outcome of absorption in an ongoing activity such as playing a video game. The second homecoming of the Gruvich family is a good example of distraction. Becky remained glued to the television as her father tried to greet her. In many households, screen media were powerful rivals for children's attention. To find out how CELF working parents were welcomed home, we turn first to how couples welcomed each other and then to how children welcomed fathers and mothers. Husbands and wives generally welcomed their partners home positively but were also distracted, with wives being more distracted than husbands. Now let's look at the numbers. Positive Behaviors. Recall that there were many fewer occasions in which CELF working mothers returned to family members already in the home relative to CELF working fathers. Yet five of the nine times (56 percent) that mothers returned and their husbands were already at home, the husbands behaved "positively"; that is, they greeted or showed affection. Mothers were positive to their returning husbands even more frequently, in nineteen of twenty-nine reunions (66 percent). Distraction. Husbands were distracted in 33 percent of the occasions when their wives returned home from work later than they did. Wives, however, were distracted even more often-45 percent of the occasions that their husbands returned home. Wives were not oblivious to their husbands' arrival. Rather, they were usually caught up in a swirl of tasks-monitoring children's homework, TV watching, and playtime, along with meals, laundry, and other household chores-that precluded giving their husbands their full attention. These activities were in full swing by the time working fathers walked in the door-well after the arrival home of the mothers. Preoccupation with housework and childcare and the later hour of fathers' arrival home cannot fully account for these observed levels of distraction, however. It takes only a few seconds to turn one's attention away from what one is doing to greet a returning partner, and fathers frequently were not granted even the briefest whiff of recognition. A Doonesbury cartoon strip a few years ago portrayed a father opening the door to his teenage son's room and asking if it is okay to come in. His son assures him, "Adults your age are invisible to us. You walk into a room of kids, no one will stand or acknowledge you in any way." After his father sighs, "Yeah, I hate that," his son continues, "I mean, unless you are holding a gun or a pizza or something." Is this how the CELF children responded to their returning parents? To address this question, we asked, "To what extent did each child display positive behavior, report information, engage in logistic talk, display negative behavior, or distraction toward their returning fathers and mothers?" Then we asked a different question: "To what extent did returning fathers and mothers receive positive behavior, report information, engage in logistic talk, display negative behavior, or distraction from at least one of their children?" This second question gives us a glimpse of the psychological experience of a parent returning home. For example, a positive reception from at least one member of the family may buffer a returning parent from feeling completely ignored. The picture we found for reunions between working parents and their children, especially for working fathers, differs from what we saw for couples reuniting at the end of day. Here are the details. Positive and Negative Behaviors. Children welcomed returning fathers differently from mothers on their arriving home from work. The children welcomed their fathers with positive behaviors-greeting, hugging, or otherwise demonstrating affection-in only 44 percent of the homecomings, compared to 59 percent of the homecomings of their mothers. When we looked at the possibility of fathers and mothers being welcomed positively by at least one child, however, it was comforting to find that both fathers and mothers were greeted positively by at least one of their children every time (100 percent) they returned home from work. Thus, while fathers did not experience positive attention from children more than half of the time they reentered the household, they could count on one of their children to greet them positively. Moreover, on the optimistic side, children very rarely acted in a negative manner to either returning fathers (4 percent) or returning mothers (2 percent). Logistic Behaviors. Although children infrequently brought up a logistical matter in the first moments of their parents' arrival home, it is striking that they engaged returning mothers in the logistics of homework assignments, lost belongings, items to purchase, and the like twice as often as they engaged father in such concerns (22 vs. 11 percent). Again this difference may indicate that the children had different expectations of their mothers and fathers or even of their relative pragmatic usefulness. Alternatively, it could be that fathers' later arrival home meant that certain practical problems were handled earlier by the first parent in contact with the children (i.e., the working mother). Looking at the possibility that at least one child was distracted when a parent returned home, we found an even more striking difference for working mothers and fathers. Mothers were met by at least one distracted child on 44 percent of their homecomings, but fathers were met by at least one distracted child on 86 percent of their homecomings. In other words, while mothers were frequently ignored, fathers were characteristically ignored by at least one of their children. Based on these findings, Nash's witticism might be rewritten as, "Children aren't happy without something to ignore, and that's what fathers were created for." As argued for other differences we observed, the high degree of distraction toward working fathers may be partly an effect of the later time theys return home, when children were preoccupied with other activities. This study conveys both good news and bad news regarding the fate of men and women who seek to reconnect with their partners and children when they return home from work. The good news is thatthe reunions between working parents and the rest of their family are more positive than popular media suggest. Over half of the reunions between CELF couples were positive. Moreover, returning parents always found that at least one of their children greeted, approached, or displayed affection to them. Despite the challenges inherent in the urban life worlds of our CELF families-long hours of work-school separation and nuclear rather than extended family arrangements-they tried to capitalize on the brief opportunities embedded in the routine of the day to reconnect with one another and affirm family bonds. On the flip side, we have to ask ourselves as researchers (and as parents) why partners and children did not display positive behaviors more often to welcome parents home. Given that across societies most people greet and convey positive sentiments when they reunite, it is striking that the middle-class American children in this study did not demonstrate such behaviors in 56 percent of the reunions with their fathers and 40 percent of the reunions with mothers returning home from work. One explanation could be that working parents were unconcerned about whether or not their child or spouse said hello or gave them a sign of affection. Our video recordings indicate, however, that it mattered a great deal. CELF parents relished positive contact with their children when they arrived home and were disappointed when such attention was not forthcoming. Indeed, these small moments set the tone of subsequent interactions throughout the evening. Positive greetings gave way to smooth, rewarding social exchanges, while distraction disappointed the returning parent, which may have contributed to fathers spending less time with other family members on weekday evenings. Of course, a greeting proffered by a parent to a child or by one partner to another is only one of many moments in which to communicate with one's family. The whole evening lies before parents and children and couples. In the chapters that follow we will see just how these moments are seized by family members, including the extent to which the family comes together as a vital social institution. Called “the most unusually voyeuristic anthropology study ever conducted” by the New York Times, this groundbreaking book provides an unprecedented glimpse into modern-day American families. 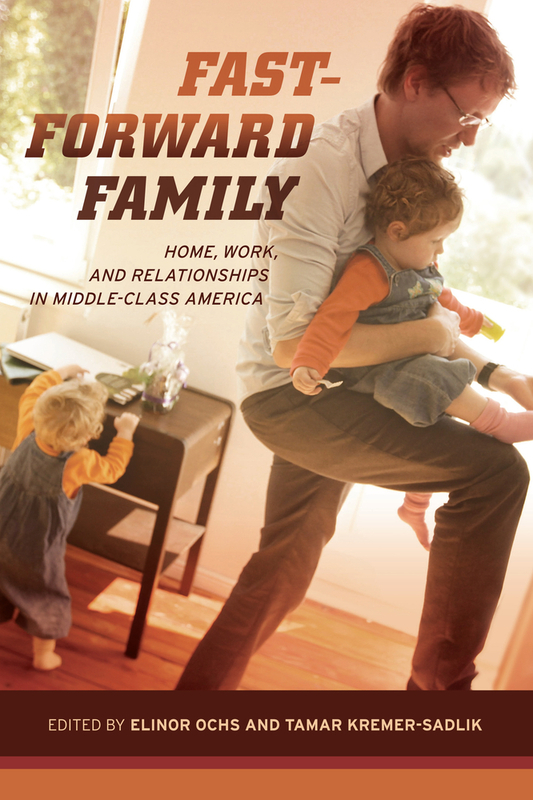 In a study by the UCLA Sloan Center on Everyday Lives and Families, researchers tracked the daily lives of 32 dualworker middle class Los Angeles families between 2001 and 2004. The results are startling, and enlightening. Fast-Forward Family shines light on a variety of issues that face American families: the differing stress levels among parents; the problem of excessive clutter in the American home; the importance (and decline) of the family meal; the vanishing boundaries that once separated work and home life; and the challenges for parents as they try to reconcile ideals regarding what it means to be a good parent, a good worker, and a good spouse. Though there are also moments of connection, affection, and care, it’s evident that life for 21st century working parents is frenetic, with extended work hours, children’s activities, chores, meals to prepare, errands to run, and bills to pay. Elinor Ochs is Distinguished Professor of Anthropology and Applied Linguistics at UCLA and the author of Linguaggio e Cultura, co-author of Constructing Panic and Living Narrative, and co-editor of Handbook of Language Socialization. Her awards include the MacArhur Fellowship, Guggenheim Fellowship, and Member of the American Academy of Arts and Sciences. Tamar Kremer-Sadlik is Social Sciences Director of Programs and Director of Research for the Center on Everyday Lives of Families (CELF) at UCLA. Watch the web series featuring Elinor Ochs, "Cluttered Life: Middle-Class Abundance"